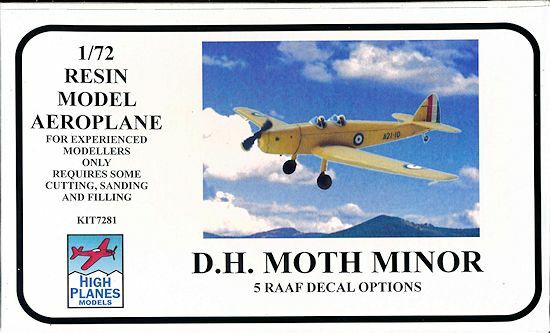 Designed as a low wing monoplane replacement for the Moth series, the Moth Minor was first flown in 1937. Around 100 were built at De Havilland's Hatfield factory before WW2. 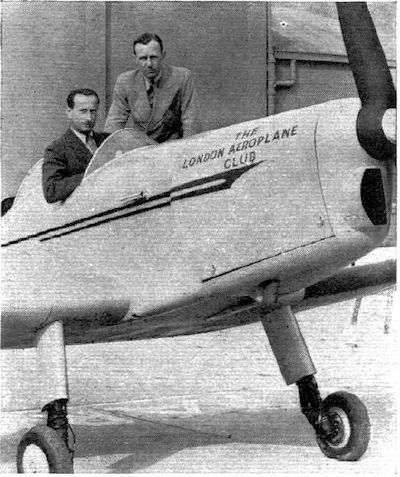 Production was shifted to de Havilland's Australian subsidiary in 1939, were about 40 more were produced. Many were impressed by various air forces during WW2, being used for training, liaison work and as squadron hacks. Some are still flying in the UK and Australia. The aircraft saw service with the RAF, RAAF, RNZAF, USAAC, Indian and South African air forces. Coming in a small end opening box, there are 25 pink coloured resin parts, and four vac-formed windshields. The one piece lower wing casting was a little warped. There are no visible bubbles. 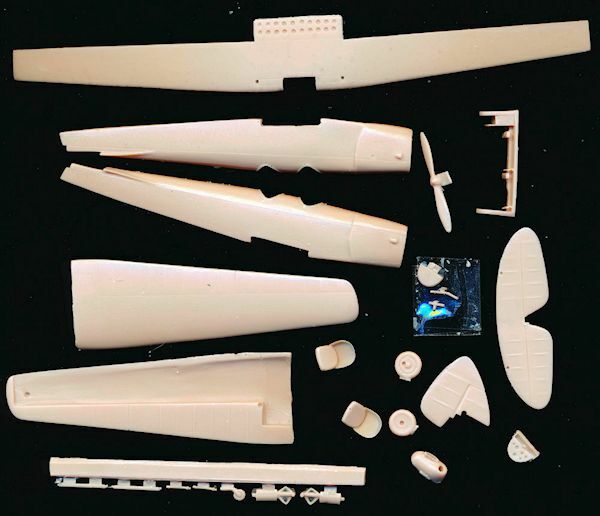 The parts have a smooth surface finish, with fine but soft raised panel lines. The prominent stringer is moulded nicely as are the anti-spin strakes. There is fabric detail on the control surfaces. Cockpit detail is sparse, with seats and control sticks to be attached to a floor, and instrument panels. There is some structure moulded on the inside of the cockpit walls, that a bit of painting should bring out. A bit more detail may be wanted as there is a relatively large cockpit opening and no crew figures supplied, although crew are shown on the box top. Some of the small parts were detached from the pouring stub and supplied attached to a piece of tape. The vac-formed windshields are tiny, delicate and very clear. A nice touch is the provision of spares. The decal sheet, printed by Wessex Transfers, supplies markings for five RAAF aircraft in a variety of schemes, all yellow, all silver, and some camouflaged examples. The instructions are two sheets of A4, clearly printed on both sides in English, showing a short history, assembly notes with details of extra bits needing scratch built, exploded diagrams, colour painting and decalling guide with coloured profiles and plans. It includes paint references with FS numbers. It does not show placement of the smaller parts, but most of these are shown on the profiles. A small resin model of a military training and civil touring aircraft. Other than the supplied schemes, many other civil or military schemes could be used. The aircraft was used for camouflage experiments by the RAAF, with two interesting profiles illustrated in Pentland. Recommended for anybody with some experience, and could be a good first resin kit with it's small parts count and minimal scratch building.